On today’s Upgrade Your Nutrition challenge, we’re going to swap rice for more veggies. 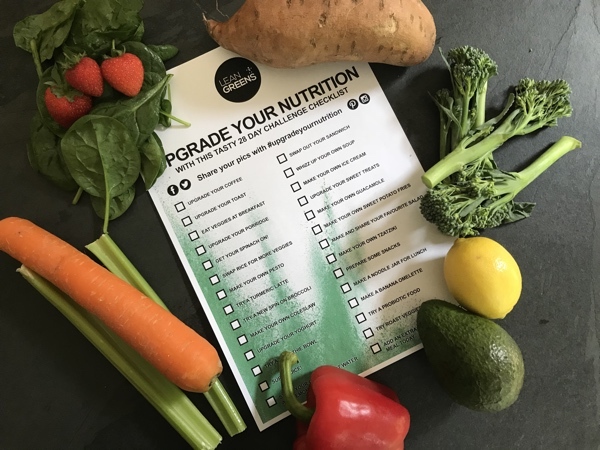 Just a reminder, of if you’re just joining us, this is a 28-day challenge to Upgrade Your Nutrition by not worrying about cutting stuff out. Instead we’re looking at different ways we can get more veg, more fruit and more fresh foods. Today we’re having a curry because it’s a bit cold and horrible in Scotland. 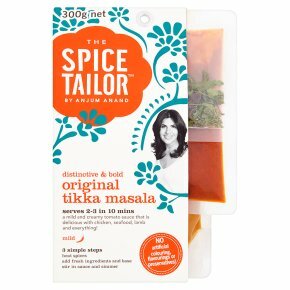 And this is one of my favourite curry sauces at the moment. It’s a three-step sauce mix — you have some spices, then a base sauce, and then your final sauce. There’s nothing wrong with a decent curry sauce for a quick midweek meal. This one doesn’t have very much sugar. If you check the ingredients list, it’s very short, which I like. I have my chicken curry made and that’s bubbling away nicely. Now normally we would be having some rice and or Naan bread with it. But today’s challenge is to not have the rice, and have loads of veggies instead. I used to try and make veggie curries, but I always found that I either ended up with undercooked veg or mush. So this is my new favourite toy in the kitchen, and I use it a lot. I mentioned it in the Roast Mediterranean Vegetables video too, it’s an air fryer. And in here I have been air frying, in a tiny bit of olive oil, some red peppers, onions, some butternut squash and some courgette. I have found that this is certainly for me the quickest and easiest way of gets loads more veg in my curry. My veggies took about 20 minutes in the air fryer, the same time as my curry to this stage. And now all I do is pop my lovely sautéed veggies into my curry for the last couple of minutes. Let that heat through. And there you go. My Airfryer is from Lakeland, and you can also get it on Amazon. Fantastic bit of bit of kit. Give my idea a try, or let us know how you sneak your veggies into curry. And if you got a good recipe, let me know!